Originated from the Siamese cat, the Balinese cat is an American breed. During the 1920’s, longhair kittens were showing up in Siamese litters. They could not be used as a show cats and were sold as pets. During the 1950’s, Helen Smith of New York and Marion Dorsey of California began a breeding program to produce longhaired Siamese. This began the evolution of the Balinese cat. Originally known as the longhair Siamese cat, Helen Smith felt the name didn’t flow well. Instead they were named for the graceful Balinese dancers. As time progressed, breeders worked on breed variations. Today there are two types recognized. The Balinese and the Javanese. The Balinese male should weigh 12 to 16 pounds and the female should weigh 8 to 12 pounds. Its head is round (medium in size) with long pointed ears. Its eyes are almond shaped and deep blue. The Balinese’s body is long with a tall neck and long legs. The back legs are longer than the front legs. It’s coat is silky and about two inches in length. The Balinese has a long plumed tail. There are only four point colors recognized for the traditional breed. They are seal, blue, chocolate, and lilac. The contemporary Javanese, carry many of the same characteristics as the Balinese. They differ in coat length and color. Other than the tale, the Javanese has a short coat and point colors of lynx, tortie, and cream/red. The average life span of both breeds is 10 to 14 years. One cannot help but notice the Balinese cat’s immense grace and beauty. The Balinese cat’s gracefulness is topped only by their intelligence. On an intelligence scale of one to ten with ten being the highest, the Balinese cat is rated a nine. They have the highest intelligence of the longhair breeds. The Balinese cat is a friendly breed. They are good with children and other pets. They will not allow being mistreated and may moan, growl, or hiss to show dismay. They typically don’t scratch when they are irritated. They like to ride around on their owner’s shoulders, help to read the newspaper, and have been known to carry on conversations. An owner should listen to their Balinese cat. If they are vocalizing for no apparent reason, the owner should listen. The Balinese cat may be alerting the owner to an emergency situation. Balinese cats are easy to train. The owner needs to show them what is good and what is bad. They can be taught to stay off of counters and tables. They can be taught to use a scratching post instead of the furniture. To teach them to stay off of counters and tables, aluminum foil can be used in these areas. They will not like the sound or feel of the foil and they will quickly learn to avoid the counters and tables. Another option is to use a small squirt gun or spray bottle. Hitting or yelling at the Balinese cat is not an option. Be kind and gentle when teaching them. Teaching them to use a scratching post instead of the furniture may already be done. Respectable Balinese cat breeders will have already shown them to use the scratching post. If not, sprinkle some cat-nip on the post. This will attract the Balinese cat to the post and they will leave the furniture alone. Exercise and play are just as important as training. You don’t have to break the bank buying expensive toys for your Balinese cat. In fact, they will be just as happy batting around a twist ring from a milk carton or a ping pong ball. They will also be happy with an empty box they can explore. A paper bag will entice their curiosity. Grooming for your Balinese cat is less stringent than other long-haired breeds. Since their coat is not prone to matting, daily grooming is not necessary. To promote good skin health, you should groom at least every other day. Grooming can be done as part of play time. The Balinese cat can be fed either dry or canned food. The proper ingredients for nutritional health are present in both foods: dry and canned. For the majority of their life, dry food is acceptable. When the Balinese cat reaches its senior years, consider using canned food. Older cats are prone to dehydration and using canned food keeps them hydrated. Although food choice is a matter of owner preference, litter choice is a matter of cat preference. You may need to experiment with litter types. Start with inexpensive clay litter. Clumping and odor reducing litters may not work for the Balinese cat. They may not like the smell or may have a hard time scratching the litter to cover their waste. The litter box should be cleaned daily. A clean litter box does not smell. 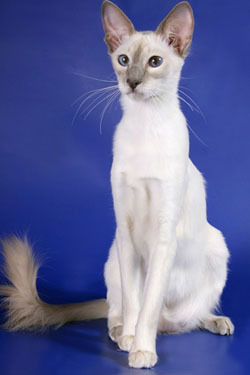 Vocal, intelligent, and graceful are just a few of the traits of a Balinese cat. With the proper care, exercise, and training, the Balinese cat will give any pet owner years of enjoyment.